Roasted Corn Salad is one of those salads I can’t get enough of. It’s filled with lots of my favorite things. 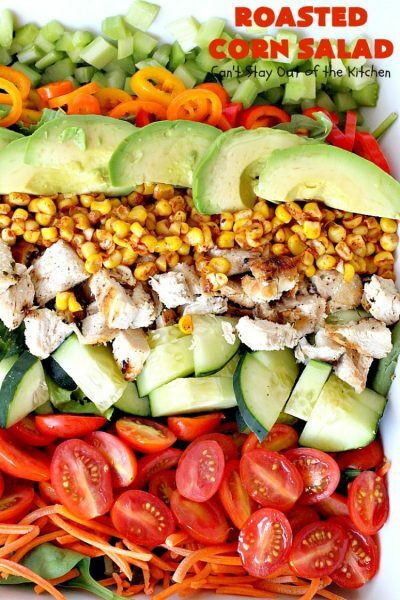 This salad includes tomatoes, fresh corn that’s roasted in chili powder, paprika, cumin and other delicious seasonings, grilled chicken, avocados, cucumbers, matchsticks carrots, celery, cucumbers and bell pepper rings. It’s healthy, crunchy and tastes delicious. Every now and then I have a hankering for a really top-of-the-line salad. 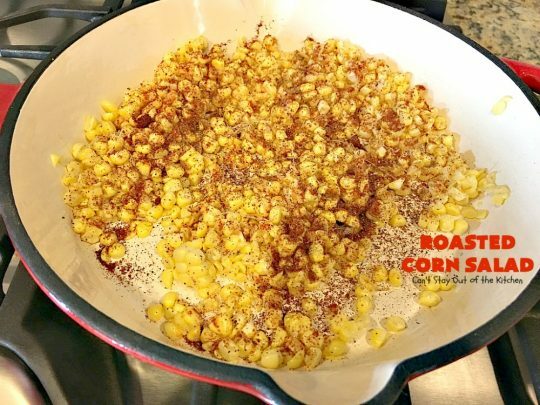 I love the idea of roasted corn and got the idea from a recipe I made with sweet potatoes that includes that. I also wanted the salad to include plenty of protein so that’s why it’s got grilled chicken. 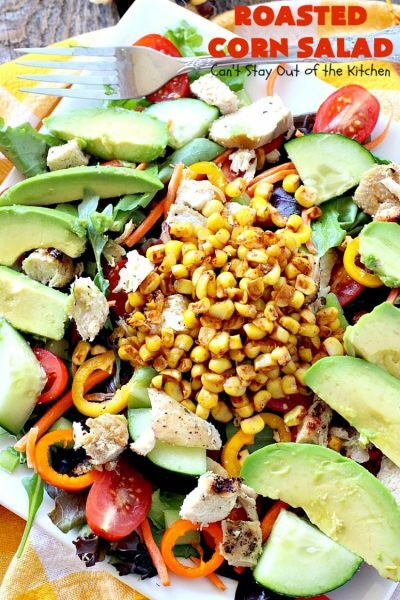 The avocados add the good healthy oils and then all the other fresh veggies provide crunch and texture at very reduced calories. 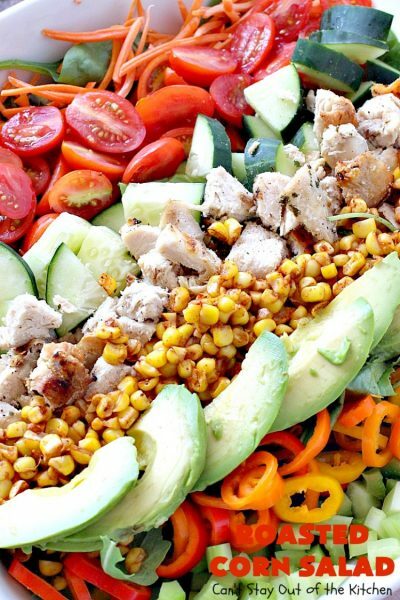 This healthy salad is clean eating and gluten free. I served it with an oil and vinegar dressing, but this is also tasty with any kind of Ranch dressing. If you’re looking for a fantastic main dish meal salad, then consider Roasted Corn Salad. You can make it the night before you need it except to leave off the avocados and add just before serving. It’s a refreshing salad to serve during the summer especially when corn-on-the-cob is seasonal. If you can’t locate fresh corn-on-the-cob, frozen or canned corn can be substituted. That way this tasty salad can be served in the middle of winter as well! Enjoy. 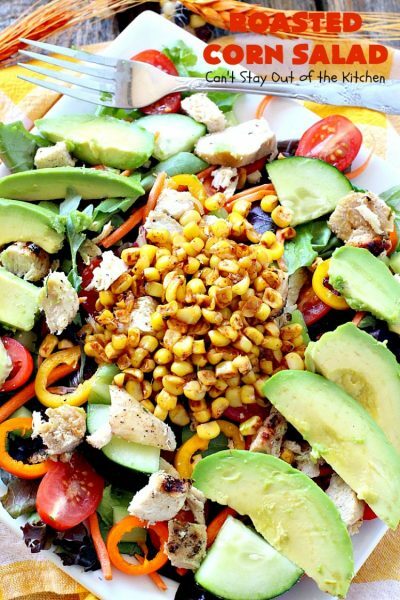 Roasted Corn Salad is not only clean eating but delicious too. 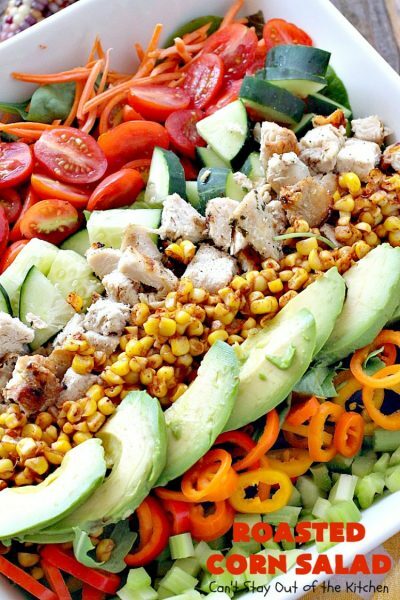 Every bite of this tasty salad is chocked full of healthy, fresh veggies. 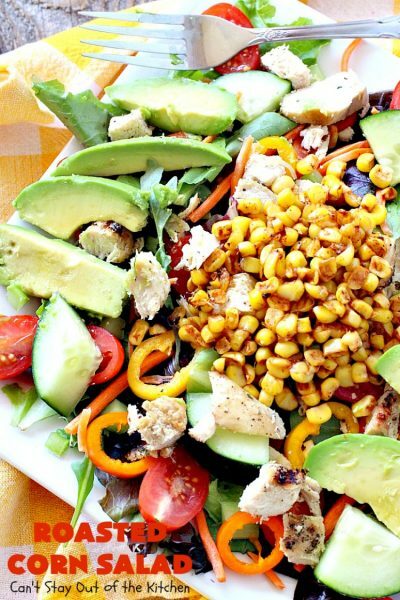 The roasted corn adds scrumptious flavor to this salad. Shuck corn and remove silk. Slice corn down and place in skillet without oil. Add paprika, cumin, chili powder, salt and pepper to taste. Allow corn to roast a few minutes before stirring. Roast corn about 8-10 minutes until lightly browned. Remove from heat. Cool. Place lettuce in a large salad bowl. 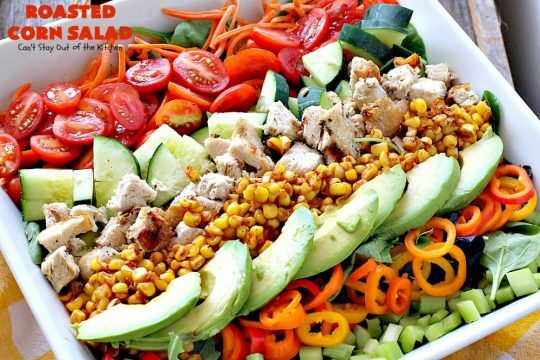 Add matchsticks carrots, tomatoes, cucumber, celery, miniature bell pepper rings, avocados, chicken and roasted corn. This salad is healthy and gluten free. 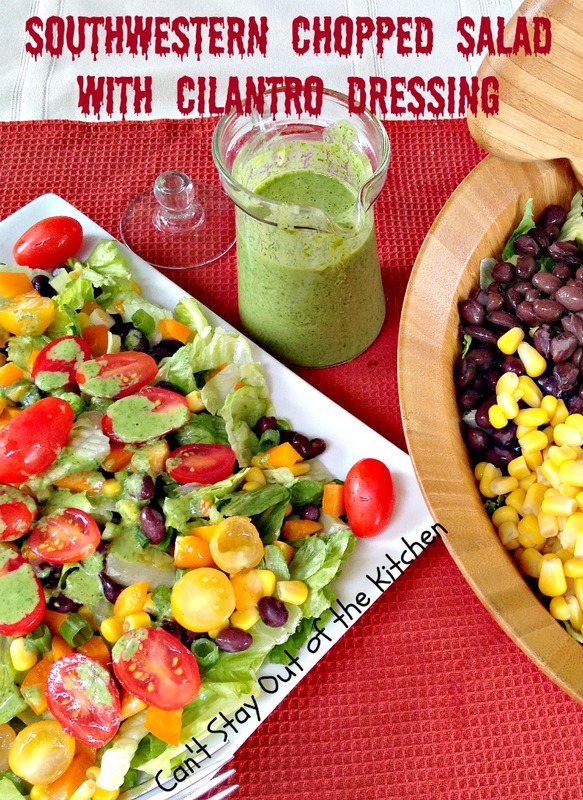 Serve Roasted Corn Salad with your favorite salad dressing. Avocados and grilled chicken make this salad very filling and satisfying. 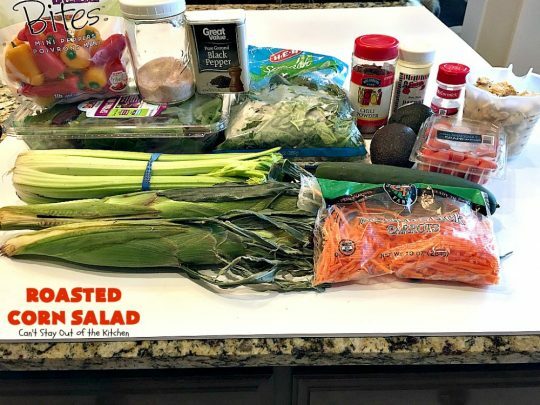 This scrumptious salad is chocked full of healthy veggies like avocados, tomatoes, cucumbers, bell pepper rings, celery, matchsticks carrots and lettuce. 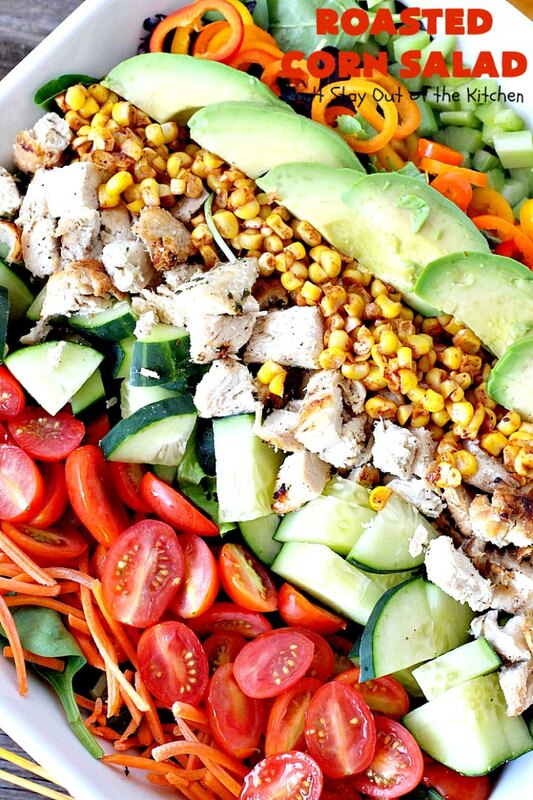 Grilled chicken and roasted corn provide exciting flavor and texture. It's the perfect main dish salad when you want a healthy, clean-eating, gluten free recipe. Place corn in a skillet over medium heat (without oil). Add chili powder, paprika, cumin and salt and pepper to taste. Allow corn to roast a few minutes before stirring. Roast corn about 8-10 minutes until lightly browned. Add tomatoes, cucumber, carrots, celery, chicken, roasted corn and avocado. Serve with Ranch dressing or your favorite salad dressing. NOTE: Preparation time does not include time required to grill chicken. NOTE: If refrigerating overnight do not add avocados. Add them in just before serving. NOTE: If fresh corn-on-the-cob is not in season, you can substitute drained, canned corn or frozen corn for the fresh corn. Roasted Corn Salad is one of my favorite salads. 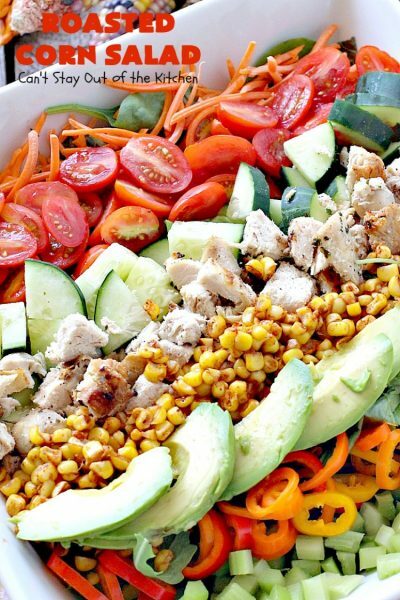 It’s filled with so many delicious fresh veggies. The roasted corn adds a slightly Tex-Mex flair to this recipe. 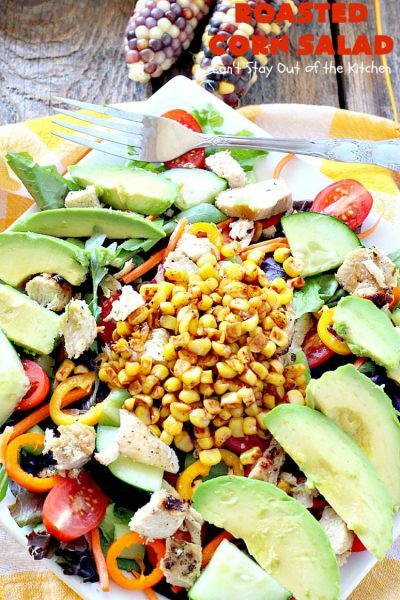 If you’re looking for a wonderful main dish salad, give Roasted Corn Salad a try. Roasted Corn Salad can be made with frozen or canned corn if you’re unable to locate fresh corn-on-the-cob.